In these lessons, we will look at using nets to calculate the surface area of a cube, rectangular prism or cuboid, triangular prism, cylinder, pyramid and cone. A net is a pattern made when the surface of a three-dimensional figure or solid is laid out flat showing each face of the figure. 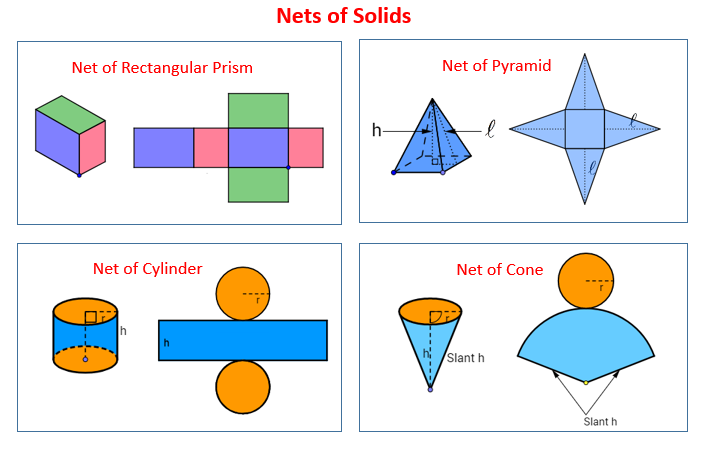 It is then possible to use the net to calculate the surface area of the solid. A cube is a three-dimensional figure with six matching square faces. 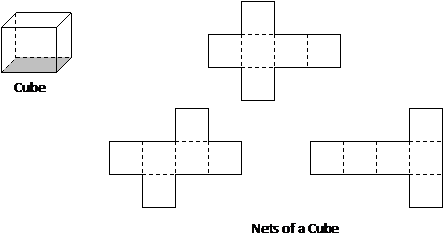 The following nets can be folded along the dotted lines to form a cube. How to find the surface area of a rectangular prism when its net is given? How to find the surface area of a rectangular prism using nets? How to find the surface area of a triangular prism using nets? How to calculate the surface area of a triangular prism by first drawing a net for the prism? How to find the surface area of a cylinder by drawing the net? How to find the surface area of a pyramid and a cylinder by drawing the nets? How to find the surface area of a hexagonal prism by drawing a net? How to find the surface area and volume of a right circular cone?